Establishment of dense vigorous stands of alfalfa is essential for long-term profitability, but establishment can be challenging because seedling alfalfa is vulnerable to competition from annual weeds and wind and water erosion. Roundup Ready Alfalfa was re-introduced last year as a new tool available to farmers growing high quality alfalfa. While not for everyone, it will be useful for many alfalfa growers. A first and important question is concerning the yield potential of RR varieties. While the RR trait was generally put in better germplasms, early trials (planted in 2006) showed a range of yield potential for RR varieties. It is too early to tell definitely for the next generation of RR varieties since we only have seeding year data from 2011, however it appears again that there will be a range of yields with some RR varieties in the top yielding group and some doing less well. It will be important to check variety trials to select high yielding varieties. Many Wisconsin farmers have felt the need to seed alfalfa at rates as high as 17 to 18 lb/a. Data from many trials have shown that, regardless of seeding rate, the alfalfa stand thins to 30 to 35 plants/sq ft by the end of the seeding year. Improved stands or yield above 9 to 10 lb seed/a have never been observed. One of the reasons stated for the higher seeding rates is greater competitiveness against weeds. An option for RR alfalfa is to seed at the lower rate and get good, cost effective weed control with Roundup. The lower seeding rate also improves the economics of using RR alfalfa since the technology fee is per bag and the more acres seeded per bag, the lower the fee is per acre planted. To get good stands of alfalfa we must control weeds during the first 60 days. It is during this time that competition from weeds will cause stand thinning resulting in a stand with greatly reduced yield potential in future years. In some environments alfalfa naturally begins growing rapidly in the spring and stays ahead of the weeds so that not herbicide is needed to get a good, thick, weed-free stand. However, most often weeds do come up with the alfalfa and must be controlled to get good stands. In these situations, Roundup is an effective post-emergent weed control. It has a wide window of application for effective control, relative to other herbicides and also has a short harvest restriction so that alfalfa harvest is not delayed by the herbicide used to control weeds. While Pursuit or Raptor have been reliable herbicides for controlling weeds during stand establishment, they can reduce yield of the cutting to which they are applied. Over 13 site-years of trials in Minnesota and Wisconsin, we have seen and average of 0.2 t/a yield reduction. The yield loss ranged from near 0 to 0.5 t/a in the seeding year and tended to be worse in cooler environments. Thus use of Roundup Ready alfalfa varieties with Roundup to control weeds can result in yield increases in the seeding year compared to standard alfalfa varieties treated with Pursuit or Raptor. Additionally Roundup is easier to use, since most farms are growing Roundup Ready corn and/or soybeans and already have the herbicide on hand and sprayer calibrated. We also saw some benefit in 2011 to using roundup ready varieties when field conditions forced late plantings of the alfalfa. Roundup did and excellent job of controlling the different populations of weeds that occurred with the late plantings. Companion crops reduce stand loss due to wind and water erosion and may suppress growth of some weeds. For spring seedings in the Midwest, companion crops also provide for a guaranteed economic return in the seeding year. One of the exciting potentials for Roundup Ready alfalfa is shown in the picture where oats was seeded at 1 bu/a, with the alfalfa to provide early weed and erosion control and, in some cases, to help dry out soil. The oats is then killed with killed with Roundup when it is 4 to 6 inches tall. In five site-years of trials between Minnesota and Wisconsin, we have used this treatment with no difference in alfalfa yield during the seeding year whether the oats was seed and killed at six inches or whether the alfalfa was seeded alone. This establishment method has been available using Poast Plus or Select but neither herbicide control broadleaf weeds that sometimes come into the seeding as Roundup will. This method of establishment can meet certain farm plan requirements on erosive land while giving the benefit of direct seedings. One of the other questions frequently asked is concerning proportion of the seed in each bag that is not Roundup Ready (“nulls”). Plants from these seeds will be killed when the stand is first sprayed with Roundup. The actual amount of nulls is usually less than the stated amount and ranges from 2 to 8% of total seed. Remember that at 12 lb/a seeding rate we are seeding twice the seed that we need and stands will naturally thin to about 30 to 35 plants/a. So whether we lose the 5 to 10% of plants from non Roundup Ready seed has no affect on the final stand. However, it is important to take these “nulls” out early in the stand life so that the stand does not thin naturally, as described, and then get thinned again with Roundup to potentially produce holes in the stand. We are uncertain of how early in the stand life we need to spray to remove these “nulls” without final stand density at the end of the seeding year. One option may be to seed alfalfa with a cover crop, such as Italian ryegrass or oats, harvest a cutting of the cover crop to increase seeding year yield, spray after harvesting the cover crop and then have a pure alfalfa stand. We are also examining seeding the alfalfa, spraying with Roundup and then seeding a perennial grass into the stand to establish grass legume mixtures. On established alfalfa stands weeds seldom cause stand thinning but rather fill holes were alfalfa has died out. Therefore weed control after the first 60 days is seldom economical except for commercial hay growers who receive a premium for pure alfalfa. Other alfalfa growers can feed the weedy forage to animals and would see little return from use of weed on the stand since total forage tonnage is likely to remain constant or may actually decline. Weedy established stands generally indicate thinned stands with low yield potential that should be replaced. The only exception to the lack of need for weed control on established stands of alfalfa is where winter annual weeds, such as henbit, chickweed, or wild garlic, grow and can cause stand thinning. Roundup is an effect method of controlling these weeds. Some concern has been expressed about the potential for Roundup resistant weeds in a system with Roundup Ready alfalfa, corn and soybeans. Clearly when any pesticide is used alone and repeatedly, the target organism(s) will develop resistance. We have seen this with fungicides, insecticides, and some herbicides. We have one advantage in alfalfa-corn-soybean rotations over corn-soybean rotations, in that we have the additional weed management tool of frequent forage cutting to keep weeds down. For example mare’s tail has reportedly developed Roundup resistance. This could be a problem in corn-soybean rotations but will not be in alfalfa-corn- soybean rotations because frequent mowing will kill the mare’s tail. Clearly resistant weeds will eventually become a problem, as in any system where a single herbicide is used continuously, so good stewardship recommends use of some additional herbicide on at least one crop sometime in the rotation to reduce the potential for herbicide resistant weeds. The other major question has been how to take out alfalfa stands, since many have used Roundup for this. All alfalfa, including Roundup Ready alfalfa, is very susceptible to 2,4-D and Banvel, so we would recommend using one of these herbicides (probably 2,4-D) to take out old stand. We have always recommend using some of one of these herbicides with the Roundup since alfalfa naturally has some Roundup tolerance and non-Roundup Ready alfalfa field treated with Roundup will often have a few skips in control. Click here to download a spreadsheet to evaluate cost effectiveness of Roundup Ready alfalfa in your operation. 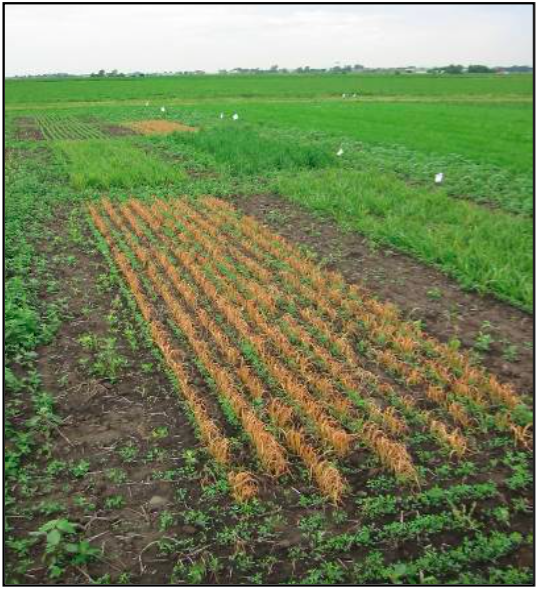 Costs and Benefits of Roundup Ready® Alfalfa in the Establishment Year by Mark J. Renz1 Weed suppression can be important during alfalfa establishment as weeds can reduce stand life, alfalfa biomass, and forage quality. 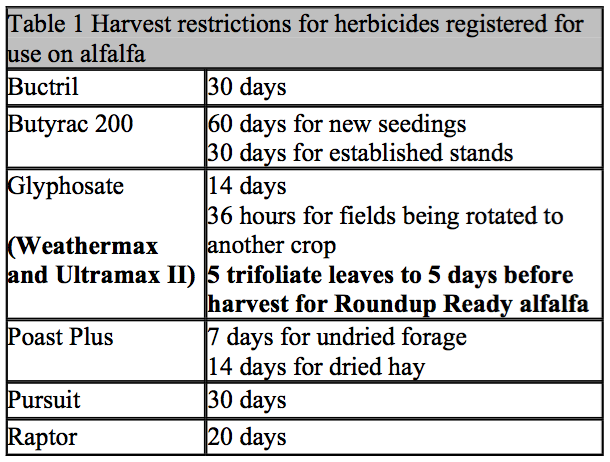 To reduce these impacts producers commonly apply herbicides to establishing alfalfa. A range of options exist, but the most common applications include imazamox (Raptor) or imazethapyr (Pursuit). These compounds have traditionally given the best control of common weeds (e.